Bource began his career composing music for commercials, but later moved on to short films, such as, En attendant (2000), Spartacus (2003), and Sirene Song (2005). After working on the Michel Hazanavicius film Mes amis, Bource has become a long-time collaborator with the director. He has since scored such Hazanavicius films as OSS 117: Cairo, Nest of Spies (2006), its sequel OSS 117: Lost in Rio (2009), and most recently the black-and-white silent film The Artist (2011). The latter, recorded with award-winning Brussels Philharmonic, elevated Bource to international fame and earned him numerous accolades, including a César Award, a Golden Globe, and an Oscar. He was invited to join the Academy of Motion Picture Arts and Sciences in June 2012 along with 175 other individuals. 1 2 McIntyre, Gina (15 January 2012). "Golden Globes: 'The Artist' wins best score". Los Angeles Times. Retrieved 15 January 2012. 1 2 Bource, Ludovic (Mar 1, 2012). 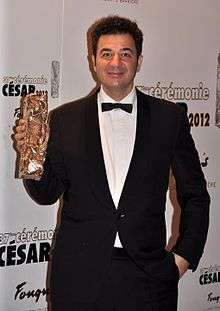 Ludovic Bource winning Best Original Score. Dolby Theatre, Los Angeles: YouTube. Retrieved 21 November 2012. ↑ Ludovic Bource Biography. AllMusic. Retrieved 9 February 2012. ↑ Jacques Brinon/Associated Press (24 February 2012). Silent film The Artist wins big at France's César Awards. CBC News. Retrieved 29 February 2012.